Sir Michael Fallon said the 280m (900ft) long carrier would have a window for entering Portsmouth which would open on 17 August. "In just two weeks' time, the most powerful warship ever built for Britain's famous Royal Navy is set to sail into her proud new home in Portsmouth," he said. "HMS Queen Elizabeth will be the Royal Navy's flagship for the next 50 years, keeping us safe by deploying across the seven seas, using her strike power to deter our enemies." 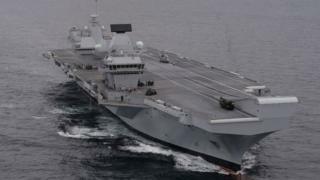 Image caption Defence Secretary Sir Michael Fallon said the carrier would be the "Royal Navy's flagship"
The carrier currently cannot deploy planes but flying trials are due to begin next year, with 10 F-35 Lightning II jets and 120 aircrew preparing for the task in the US. Preparations for the arrival of the future flagship of the fleet saw more than 20,000 items ranging from a human skull to sea mines dredged up from Portsmouth Harbour. The Ministry of Defence said specialist dredging vessels have removed 3.2 million cubic metres of sediment - the equivalent to 1,280 Olympic swimming pools - during the dredging operation carried out to deepen the harbour mouth to enable the Queen Elizabeth to reach Portsmouth naval base.